I’ll be honest. When I first stumbled across this I wasn’t quite sure what to think. First of all, I am biased as an omnivore and red meat lover. Second, it just didn’t seem very piratical. I couldn’t imagine a crew of rum swilling, sword brandishing cutthroats being vegans. The more I thought about it, though, the more sense it made. The essence of being a pirate is charting your own course, being your own person, sailing to the beat of a different drummer (and of course, rum). I think Yoho’s may be on to something and I am wishing them fair weather and smooth sailing. If you want to find out more about Yoho’s, check out these links. This was my problem – I wanted something functional, light-weight, unbreakable, semi-authentic looking, and cheap, to carry my favorite piratical beverage in at the Texas Renaissance Festival and Sherwood Forest Faire. What I really wanted was an onion bottle made of colored plastic that looked like glass. After many hours of scouring the internet it seemed unlikely that such a bottle existed and paying a company in China to produce one was going to be cost prohibitive and would blow my ‘cheap’ requirement clean out of the water. Along the way I ran across these two projects that helped me along in my thinking. The first is a plastic rum bottle that is kind of a standard liquor bottle style here. Scroll down on the page and you’ll see a good picture of it and a description of how he made it. The second was closer in shape to what I originally had in mind. It is made from a round plastic Coke bottle (they were sold in Wal-Mart stores in Dec. of ’09) and is here. 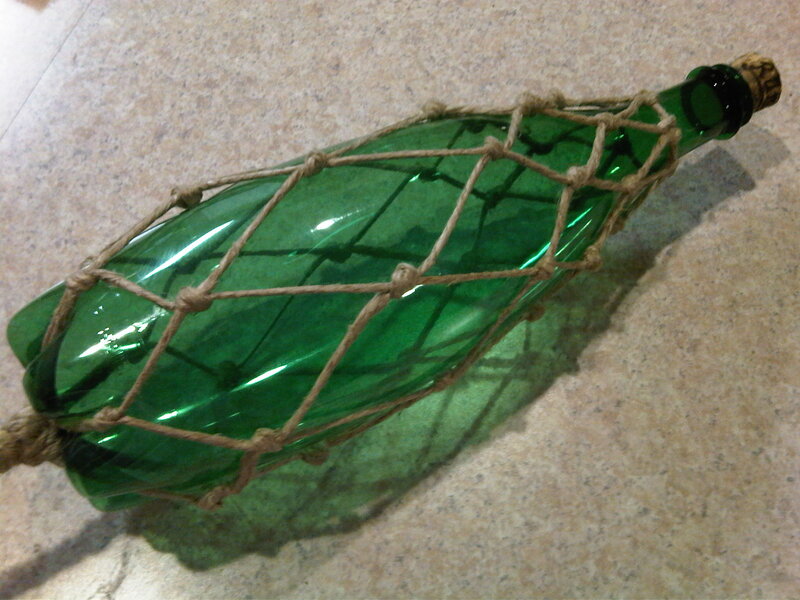 I think if you used the technique (sanding and staining) of the first bottle with this bottle’s shape and then added a hand tied net, it would look really good. I’ll have to try it later if I can get my hands on more of those round Coke bottles this Christmas. I did find plastic wine bottles online that had potential, but had trouble actually finding any locally. I finally decided on using a 1 liter plastic Perrier bottle. You should be able to find these just about anywhere. I removed the label (they are shrink-wrap plastic and come off with no residue) then cut the top threaded portion of the bottle off. 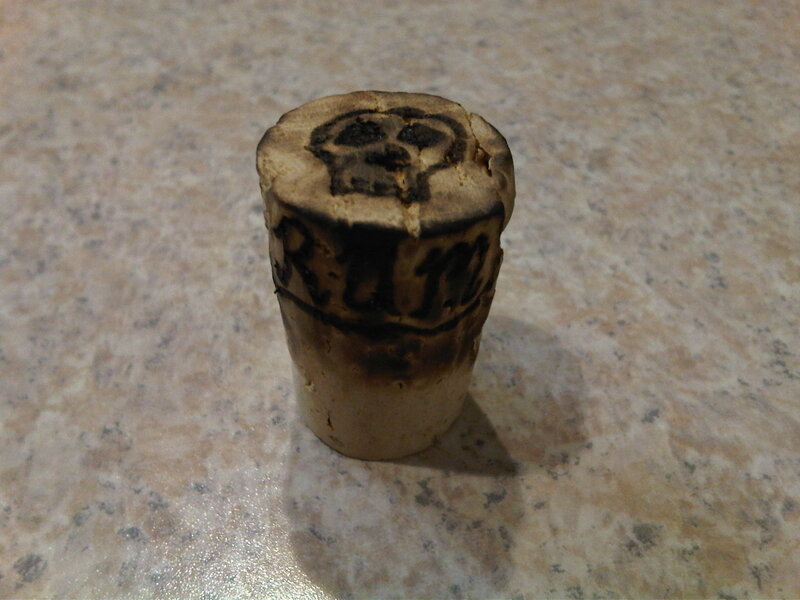 I Darkened a cork I bought from a craft store with a lighter, then decorated it with a wood burning tool. After about 5 minutes on youtube I learned how to tie my own rope netting and the result is in the first picture above. I wasn’t 100% content and decided to keep experimenting. 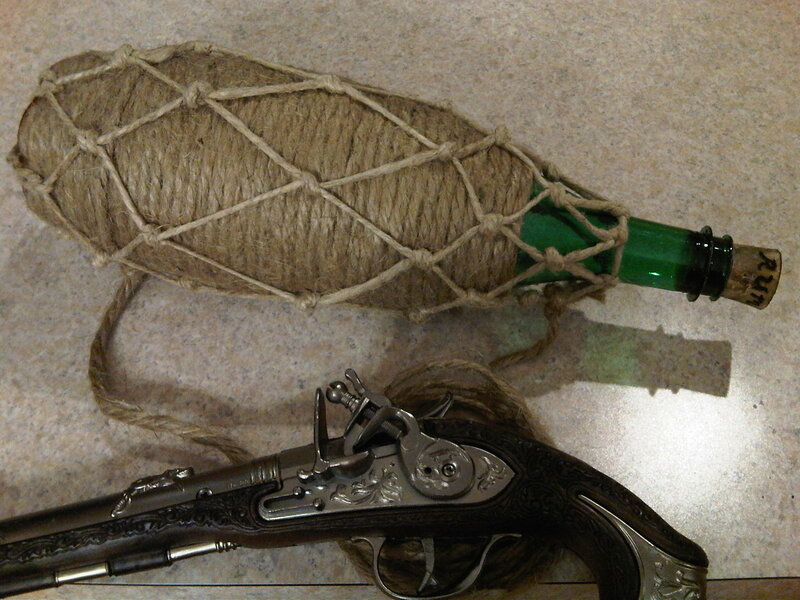 I had seen bottles wrapped in rope before and decided to give that a go. 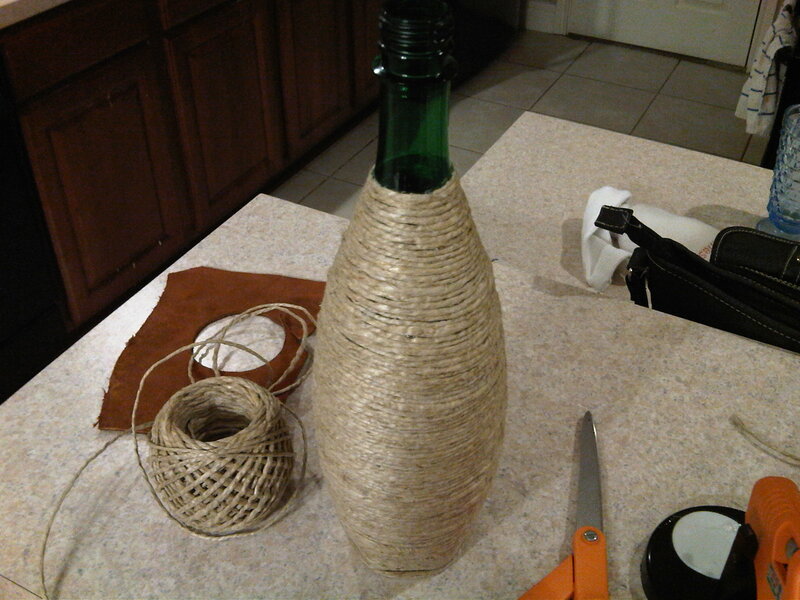 The twine I used with the first one turned out to be a little too thin and I didn’t really like the look of it. The last picture was my final attempt. I used round piece of brown leather on the bottom, a thicker rope for the wrap, and then finished it with the lighter, thinner netting over it. FYI – I did have to hot glue the crap out of the rope as I wrapped it to keep it from sliding off and coming unwound. Don’t want to make your own? You could always buy one now!